Leave a review for CareSoft Pro RC Twin! If you're looking for a city water softening solution that effectively eliminates foul odors, improves water taste, and prolongs the life of your appliances, then look no further than the CareSoft Pro RC series® from WaterCare®. Combined with our twin tank technology, this system provides the pure water your family deserves, no matter the day or night. To learn more about the CareSoft Pro RC® series or about our exclusive twin tank technology, contact your local dealer today! 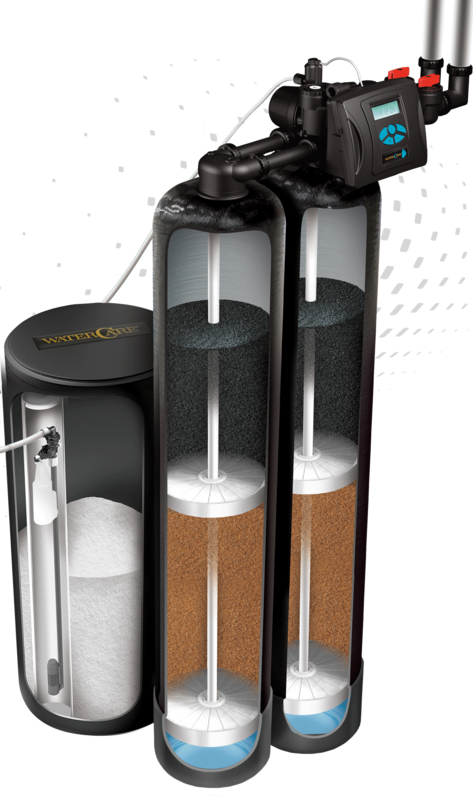 The CareSoft Pro RC Series® was designed with a split tank, providing double the efficiency and reducing the need for multiple water softening systems. In just one convenient unit you can reduce foul odors, improve your water's taste, eliminate hard water, prolong the life of your appliances, and more! Our twin tank system assures your home will have high-quality water all day, every day. Once your system has exhausted its main tank's water softening capabilities, the reserve tank will kick in, providing continuous pure water your family can count on!